Additional control panels can be accessed as needed as described here. Click on the Panel Toggles to popup the menu of choices. From the popup menu additional control panels can be toggled visible or not. These include the Brush Effects, Clips, Layers, Page View and Quick Command panels. 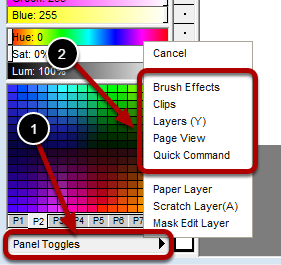 Notice the letter in parenthesis for the Layers menu. That is the shortcut key to preform the same action.